The past several days have been wonderful, despite the fact that I've had a bad cold. My son Michael took a few days vacation time to join me in Oaxaca. Time was short, so I could only offer him a whirlwind tour of this city I've loved since my first visit in 2007. Last Friday we went to Monte Albán, "the second-largest ceremonial site in Mesoamerica. "​ It's located on a levelled-off mountaintop about 1,940 m (6,400 ft) above sea level and about 400 m (1,300 ft) above the floor of the ​valley in which Oaxaca is located. The sky there is so blue, the air is so fresh, and the sun is so hot. ​Monte Alban is an enigmatic place. Conventional archaeological theory is at a loss to explain why this particular site was chosen; it is upon a tall, steeply walled plateau, it has no source of water, it was never used as a habitation center, and there is no evidence of it ever being used for strategic or military purposes. Furthermore, it was extremely difficult to construct; the building rocks were laboriously carried from the valley far below, the builders were small people (averaging only 5 feet tall), they had no metal stone-cutting tools, and they had not discovered the transportation capacities of the wheel. Yet, given all this, the site still became the second largest ceremonial center in Mesoamerica. How are we to explain this immense human endeavor? Archaeologists may respond that the great structures represent a social and religious momentum, an architectural elaboration of the earlier sacred use of the site. But then, how are we to account for that early sacred use? Over time (when I have some) I'll add more captions to these photos. 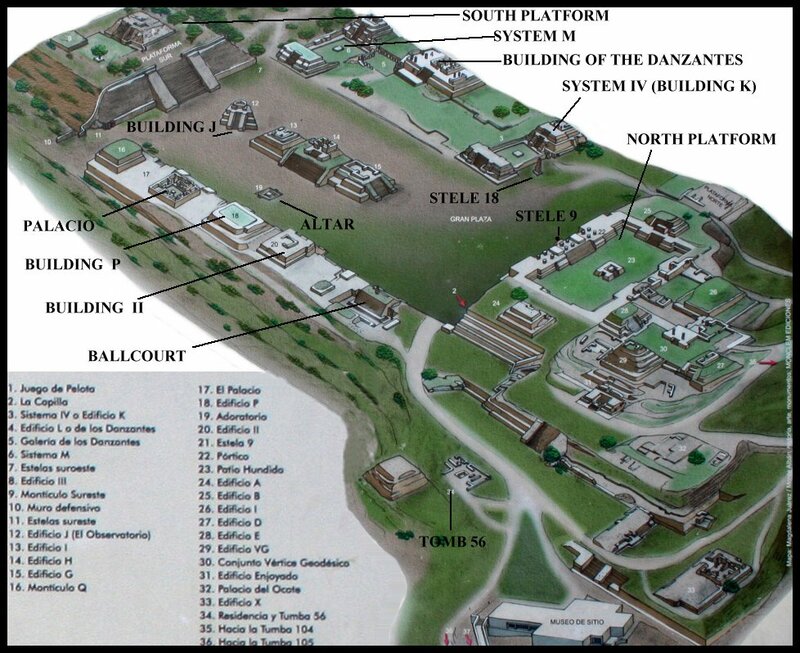 Here is a map of the site that you can use to identify some of the structures; and here is a panoramic view. If you visit Monte Albán (and you really should) be prepared to be overwhelmed by its immensity and by an appreciation of the work that went into constructing it. It becomes easier to understand why Mexicans are the hardest-working people anywhere: they've been doing this for millennia. On Saturday we went to Hierve el Agua. It's another magical place in Oaxaca. That story, coming soon. For the next few weeks my blog posts will be short. I'm in Oaxaca, and there's so much to do. Yesterday I attended the women's march here. The numbers were impressive, with many locals (including men) participating. What was less impressive was the overwhelming presence of USian women who equated anti-Trump with pro-Clinton. ​At one point I was overcome with emotion. It felt like the 60s Civil Rights movement all over again. However, I was disabused of that nostalgia when I mentioned to a woman that I would not have voted for Hillary Clinton, either. The woman's face darkened with rage as she sneered threateningly, "Don't even go there!" Maybe it wasn't very nice, but I shot back, "We came, we saw, he died. Cackle, cackle, cackle," and walked away to join a couple of women carrying little Canadian flags. It's unfortunate that some of the women in this march brought their ugly partisan politics with them. Yes, Trump is a horrible, overt racist; but let's not forget that Democrat Obama has deported more immigrants than any other president. Although Clinton said that her policy would be different from Obama's, immigration activists don't see much difference. A: His or her lips are moving. One good thing is that it's unlikely that I'll see this many of them in one place at the same time for the rest of my stay in Oaxaca. ​Travelling is in my blood. I discovered early in life that launching myself into unfamiliar places and situations, however else it might affect my life, was almost always a good cure for boredom. The darkest times in my life were those periods when I had to struggle to escape a stultifying situation. I finally managed to escape my natal home when I was 17. I'm not ashamed to say that I was a runaway. I was rebellious. I rebelled as if my life depended on it...because it did. The eldest of four siblings, my situation within my family is best shown in this photo of a delightful gift, a set of fridge magnets that I received many years ago from my very perceptive niece. I've always said I would chew off my own leg to escape a trap. There was one time, however, that I almost didn't get away and needed to be rescued. That rescue came with an invitation from my eldest son, Michael, to take a "trip across America." He was moving from Montreal to South Florida. It's a pretty direct trip, one he had made several times before. Since he was moving the contents of his apartment in a U-Haul; and since some of the things in his apartment were mine; and since I was living in British Columbia; and since he wanted to see places in Canada he hadn't seen yet...well, it worked out perfectly. I'd made a mistake moving from Montreal to British Columbia in search of better health care. In one of the most beautiful places in the world my health took a serious downturn under the "care" of Doctor Nightmare, who seems to have enjoyed writing her non-medical observations and opinions ((i.e., "hennaed hair"; "loquacious"; "dresses dramatically") and referring to me as "the worried well" while failing to inform me of the results of an ex-ray that she ordered showing degeneration of my spine (along with a note that therapy should be considered), which was the reason for the terrible pain I was experiencing, the main reason I had sought medical care in the first place. The pain in my back and legs was accompanied by a severe depression. What I didn't know at the time (or I would not have gone to British Columbia) was that I was being undermined by people in my own natal family. The two most senior members of that family, my parents, were dead, my father in 1996 and my mother in the summer of 2006. It's ironic that the money I inherited from my mother provided me with the means to begin my first Journey of Healing in the fall of that year. I had been working two days a week cleaning the Sunnycrest Mall in Gibsons, and living in a 10'X10' cabin on Mt. Elphinstone. The cabin was built as a guest cabin by one of the two self-described "mountain men" who were squatting the land. The encampment was approximately 1.5 miles up the mountain (I was told by one of the mountain men). The trail was steep and required some climbing skill. Having been diagnosed with osteoporosis, and not knowing that my spine was already damaged, I had undertaken some serious "weight-bearing exercise." Beside hauling heavy garbage and flinging it up into a dumpster at the mall, I was carrying 50 pounds of food up the mountain in my backpack, my weekly contribution to the common food supply, and helping to secure firewood. We began driving southward, from Vancouver through Washington, Oregon, Idaho, Utah, Arizona, and New Mexico. Stopping for the night at the Grand Canyon, we watched the spectacular sunrise there in the morning. Leaving, we took Route 66, passing Peach Springs, capital of the Hualapai Nation. We then drove east, across the northern part of Texas. The word "Amarillo" (yellow) used to have a nice ring to it, but now the thing I associate with it is the stench of cattle poop. We travelled across Oklahoma, Louisiana, and Arkansas, dipping down in Louisiana to New Orleans to view the damage done by Hurricane Katrina (and not even seeing the worst of it) before moving on to Michael's place in Florida. This journey was just the first of my Healing Journeys. It doesn't mean that the healing was immediate or complete. In fact, after going back to New Orleans to volunteer with Common Ground, I returned to British Columbia even sicker than I had been before. But I had set my foot on the path to physical and mental health. It's been more than 10 years since that first trip,and there have been more Healing Journeys since then. It's time to get this show on the road. I've been hanging back with this blog post. It still feels incomplete, but it's time to let it go. As I think in widening circles, making more connections and finding more clues that lead to more questions, I start thinking about incorporating it into an article connecting it with a larger issue, namely, religion as cultural glue. But then I think about the peripheral issues: Who gets to be a saint? Who gets a Basilica? But it's for another time. A new year has begun, and it's time to travel again. ​Possibly the strangest element in my balcony panorama is St. Joseph's Oratory. It's what might be called an ostentatious religious symbol sitting on the north slope of Mont Royal. It's within walking distance of that other ostentatious religious symbol, the Cross, the story of which can be found here. ​According to the Tourism Montreal website, "[t]he shrine includes a majestic building whose dome reaches 97 metres (second only in height to Saint Peter's Basilica in Rome), the small original chapel, a votive chapel, a crypt, gardens of the way of the cross, a basilica that can accommodate 2,200 worshippers, and a shrine." Yes, a shrine within a shrine. From my balcony, especially at night, the Oratory looks positively spooky. I admit that my tone is cynical, as it tends to be when I discuss religion. According to their respective interests, my US-born, French Canadian Catholic mother and my non-practising Methodist father exposed me to just about every religious shrine and old fort from Sainte-Anne-de-Beaupré, Québec to St. Augustine, Florida. In my early childhood, pretty much up until my Confirmation, I was embarrassingly religious. But times were changing. I moved out of my parents' home in 1963, when I was 17. Since the Basilica of St. Joseph's Oratory was only completed in 1967, it was not a part of my growing up. And by 1967, I was doing things I found much more interesting than visiting shrines and old forts. When I moved to Montreal in 1970, St. Joseph's Oratory was just a stop on my getting-to-know-the-city itinerary. Frankly, I was underwhelmed by the Basilica. The most interesting thing about it, in a macabre sort of way, was the display of Brother André's heart. Roman Catholicism is unique among the major religions in having a strange obsession with the body parts of dead people it deems "holy." A number of "miraculous" healings and other interventions (accepted by the Church as matters of faith, but not scientifically authenticated) have been attributed to Brother André—although he always gave the credit to St. Joseph. "Ite ad Joseph" (Go to Joseph) is inscribed on the base of the statue of St. Joseph holding the baby Jesus in front of the Oratory. A detailed online hagiography, Saint André Bessette: Montreal’s Miracle Worker, told me everything I ever might have wanted to know about the life of the saint and about the realisation of his dream of building an Oratory for St. Joseph. The Quiet Revolution (la Révolution tranquille) was well underway when I arrived in Montreal. This Globe and Mail article sums it up quite well. I'll only say that my earliest Montreal experiences were steeped in the strange, murky brew of Church-and-State as they wrestled for control of the public mind while fending off the plethora of cults (including the one I got involved in) that were vying for a share of the religious pie. My Catholic experience had been mitigated by the "melting pot" world I was exposed to growing up in New York State, so Catholics insulting the symbols of Catholicism would not have made any more sense to me than Jews ridiculing the symbols of Judaism. In Quebec, however, the Catholic Church had exerted almost total control over every aspect of people's lives. The Church, in effect, was a part of the State apparatus, and thus, was the target of righteous rebellion. Here in Quebec, La Révolution tranquille that ushered in a new era of secularism is something of a historical artifact to which many refer with pride. As the only Canadian province in which French is the sole official language, Quebec is also unique within Canada for its legal system, le Code civil du Quebec, based on France's Code Napoléon rather than English Common Law. I'm told that, in many ways, Montreal feels more European than North American. In fact, Montreal used to be called "the poor man's Paris." All I knew in my early days here was that Montreal was completely different from anyplace I'd ever been. In those days I witnessed an unusual enterrement de vie de célibataire (a "funeral for the single life," equivalent to a stag). The small party of friends rode along Ste. Catherine Street in a farm wagon pulled by a car. The bridegroom-to-be, apparently naked, sat on a stool with his arms tied to the backboard, crucifixion-style. One of his friends kept dipping his hand into a bucket of what appeared to be (sorry, there's no way to put this delicately) diarrhea and using it as lubricant to perform a sexual massage on the groom. The content of the bucket was probably not diarrhea; the stench would have offended the sensibilities of bystanders. St. Joseph's Oratory caught my attention again in 1973, when Brother André's heart was stolen and a $50,000 ransom demanded (which the Church refused to pay). In the secularised milieu of Montreal, the event seemed to spawn more derision than sympathy, inspiring an art exhibition, a Toronto Fringe Festival play, and a song by Blue Rodeo. It would be almost two years before Brother André's heart would resurface. As the story goes, the late Montreal lawyer Frank Shoofey received an anonymous telephone call offering up the heart's whereabouts. He tells the story in this December 26, 1974 CBC broadcast. And so, the tale of the heart of Brother André had a happy ending. The heart was returned to its place in the Oratory and Brother André was canonised in 2010. In recent years, someone even confessed to taking part in the heart-napping, but nothing seems to have come of it. It was, at the time, though, a wonderful drama, totally worthy of Montreal. The Catholic Church in Quebec—too big to fail? Over the years, Quebec and Canada have welcomed immigrants and refugees from many parts of the world, and this has led inevitably to the fact that a significant number of us cannot relate to the Oratory (or the religion it promotes) and do not share the ethnic background of the historically "typical" Québécois/e. Even the view of the "typical" historical inhabitant of this land is being challenged by the original peoples, who have experienced terrible abuse and attempts to erase their culture by the Church-State forces. Having survived, they refuse to be relegated to the margins of history. And so, here we all are, together. Where will we go from here? What gives me hope that it will be in a good direction is the level of intellectual discourse surrounding issues of identity and inclusion in Quebec. ​La charte des distractions ​is an example of the kinds of discussions thinking people are having here. The video is in French with English subtitles. It has lessons for everyone who sees an opportunity in times of social change to create "a world where many worlds fit."